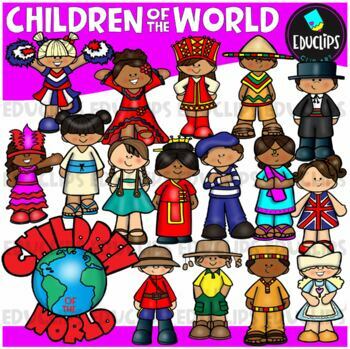 A collection of Children from different countries around the world: Africa, Brazil, Canada, USA, Germany, China, Holland, France, India, Italy, Japan, UK, Russia, Spain, Mexico and a 'Children Of The World' sign. These cartoon-like children are dressed in clothes that have some connection to their countries. This set has been designed for younger elementary children to give a brief, fun and colorful representation of each country. * This is just a general set of images of children around the world. These particular images were included as a result of asking teachers which 15 images they wished to see in a set like this (in 2015). If you don't see children or a child from a particular country, please let me know and I am happy to add your suggestion to my list for future sets. This set has been completely updated and has replaced an older version of the same set.